Whether you love it, hate it, or feel indifferent towards the current state of the heavyweight division, the unpredictability of the division is such that right now you can’t take your eyes off it. For a good decade, Wladimir Klitschko controlled the division with utter dominance over the division, at a point when boxing’s popularity took a slight plunge amongst the masses. This period in hindsight seemed like a lull in the division as the roaring flame that was the Tyson, Lewis and Holyfield era faded to black. Regardless of relative quality of his opponents, and regardless of whether you like the style in which he did it, Wlad was the heavyweight division for over a decade. The point is, any fan of the Ukrainian Hall-of-Famer would have watched on at their man with little to no anxiety for a good twelve years of his career. The same can not be said about our current heavyweights. Evander Holyfield stated in an interview last year that heavyweights today only start boxing when they’re physically big, and by starting out with punching power they miss the fundamentals that come with boxing from a young age. With one quick glance across the division today you would have to agree with him. All this vulnerability however could very well make for an exciting two to three years of title fights ahead of us. This is not a knock to any of the top 5 or even top 10 heavyweights in world boxing today, but stylistically, having seen all of them progress through their careers, you just get the overwhelming feeling that any one of them could get knocked out at any moment. In 2013 Tyson Fury was floored by cruiserweight contender Steve Cunningham. Fury later went on to win the fight, and thereafter sharpen his skillset substantially leading him to the eventual dethroning of Wladimir Kiltschko in 2015. If Fury were ever to return to the top of the division this would certainly add some flavour to the mix as it is easy to visualise him doing what he did to Wlad against any of the top 5 in the division. However, the fight on everybody’s mind right now though is Anthony Joshua vs Deontay Wilder. If ever there has been a fight in heavyweight history with an unpredictable outcome, this has to be it. Both men get hurt, regularly. Both men possess astonishing power and can change the direction of a fight with a single shot. Both men, as any fan of both fighters will have learned the hard way, are incredibly vulnerable in the ring. Most recently we saw Anthony Joshua win a comfortable points decision over Joseph Parker. Although this performance was not the explosive shootout that has become synonymous with the AJ logo that goes up in flames and lights up an entire stadium, I personally really liked this performance. Here we saw an AJ whose concentration span appears to have 10x’d over the last year, whilst controlling centre of the ring behind a beautiful jab that kept Joseph Parker out of the fight. Coming onto the scales at a mere 17st 4, AJ actually seemed to have more in the tank in the 12th round, something we have not yet seen of the heavyweight champion. Is this the perfect weight for AJ? Well, based on the evidence that we’ve seen over his last three fights, you can’t help but the that an 18st Joshua struggles against Deontay Wilder. 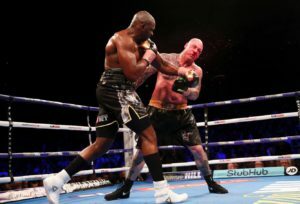 With one of the most peculiar styles I can remember seeing in the heavyweight division, Deontay Wilder is nothing short of entertaining to watch. Putting Luis Ortiz away proves that his devastating right hand is no joke, but in this fight he appeared to accidentally employ a solid defence too. Through Wilder swinging his arms fanatically and moving in a far from orthodox way, Ortiz was largely finding it difficult to tee off on Wilder even when up close. This tactic didn’t prevent Wilder from getting hurt as we saw his buzzed badly in the middle rounds, although it wouldn’t be a Deontay Wilder fight if he wasn’t at least a little bit hurt along the way. So how do the two heavyweight champions of 2018 fair up against each other? Two huge punchers, similar heights, both with a similar reach, same huge hearts and similar tendencies to leave themselves open. As is the case with all great matchups, many hairdressers, taxi drivers and people on construction sites across the world claim they know exactly who will win this fight and how. The reality is, betting on any one of these men to be unified heavyweight champion is an incredibly risky bet. With the recent cancellation of Canelo vs GGG 2, boxing needs this super fight, and as a boxing fan I really hope we see this fight soon. May the promotion companies in question please hurry up and settle their differences and make this fight for all of us.